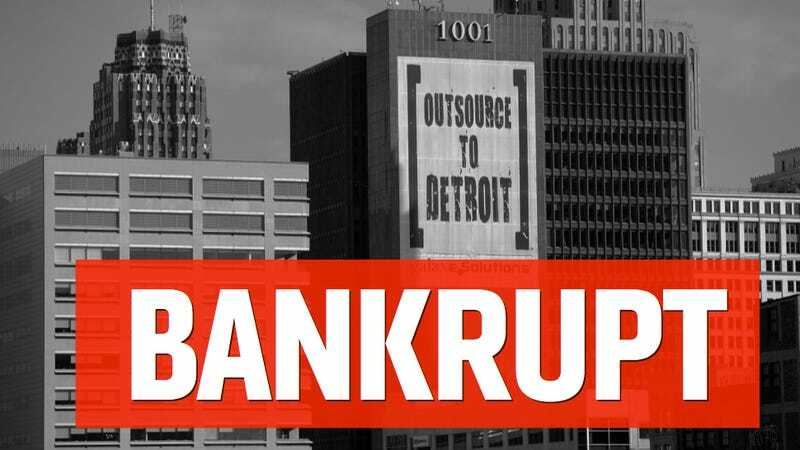 The City of Detroit has just filed for Chapter 9 bankruptcy protection, the largest municipal insolvency in U.S. history, according to news reports. Though the move wasn't expected to happen until Friday, news sources in the Motor City confirm it happened moments ago this afternoon. Today, Kevyn Orr, the city's state-appointed emergency manager asked a federal judge for permission to place the city into Chapter 9 bankruptcy, the AP reports. The filing would allow the city to seek protection from creditors and unions who are renegotiating $18.5 billion in debt and other liabilities. In June, Orr released a plan that would leave many of these creditors with "far less" than they are owed, reports the Detroit Free Press. The Freep puts it as well as anyone here: the bankruptcy would lay "the groundwork for a historic effort to bail out a city that is sinking under billions of dollars in debt and decades of mismanagement, population flight and loss of tax revenue." The filing begins a 30-to-90 day period where a court will determine if Detroit is eligible for Chapter 9 protection and what claimants might be entitled to in a settlement. Update 4:22 p.m.: Here's a copy of the Chapter 9 bankruptcy filing care of TV station WXYZ. Update 4:34 p.m.: Until today, the largest municipal bankruptcy in American history by population was in Stockton, California, which earlier this year sought protection from more than $500 million in debts. In terms of debt size, Jefferson County, Alabama was larger than Stockton with $4.23 billion in debt. Detroit today trumps both. "The fiscal realities confronting Detroit have been ignored for too long. I'm making this tough decision so the people of Detroit will have the basic services they deserve and so we can start to put Detroit on a solid financial footing that will allow it to grow and prosper in the future," the governor said. "This is a difficult step, but the only viable option to address a problem that has been six decades in the making." [...] Detroit has more than $18 billion in debt and unfunded liabilities and doesn't have the revenues to meet those obligations and provide an adequate level of services to its people, who pay the highest taxes per capita in Michigan. The city's debt level is unsustainable. Currently, 38 cents of every city dollar goes toward debt repayment, legacy costs and other obligations. By 2017 that figure is expected to reach 65 cents per dollar. "The simple fact is Detroit is in a financial crisis. The city is insolvent and has been borrowing money to pay its bills for nearly a decade. Bankruptcy is the only feasible option to fix the city's finances and do what is right for the 700,000 people of Detroit," Snyder said. Update 5:05 p.m.: What exactly happens when a city goes bankrupt? That's tough to say. The Detroit News calls it "a largely uncharted world:"
Instead of paying creditors in full, Orr would use $1.25 billion over the next decade to buy police cars and fire trucks, replace broken street lights, tear down burned-out homes, fight blight and improve city services. Orr wants to stabilize the city, woo new residents, provide essential city services for Detroiters, lower property taxes and transfer costly departments, including the water department to an outside group. Let's wish him luck with that. She's right. Here it is. I wonder why that happened?